And don’t let anyone tell you French people aren’t nice! Everyone we’ve met has been very polite and helpful. They might laugh at our French, but if they know English they will help us out. My favorite city, however, has been Lyon. Something about it just reminded me of home. It had an old town area called Vieux Lyon (literally “old Lyon”) that reminded me of St Augustine. But the narrow streets and little patisseries were so classically French, I swear it was straight out of the movies. People were even carrying baguettes! We got to see several old churches, and even caught part of a Good Friday service, and we also saw two very cool museums: the museum of miniatures and cinema, and a museum of the history of Lyon. When you’re surrounded by such a long and rich history, America pales in comparison. Well, au revoir for now! I need to catch some sleep while i can. All this travelling wears a girl out! Bon soir! 140 years ago three women made a promise to one another. They promised a lifelong bond of loyalty and support, and they promised that together they were going to go out into the world and Do Good. Their motto was so incredibly simple, and yet it means so much. How do we carry on that legacy? Today there are over 220,000 Delta Gammas all over the world. We all hope to “to foster high ideals of friendship, promote educational and cultural interests, create a true sense of social responsibility, and develop the finest qualities of character.” Delta Gamma’s young and old are committed to helping others in whatever way they can, be it through our national philanthropic efforts to make a difference in the lives of those who are visually impaired, or through individual charitable works. But those facts are things you can find on Wikipedia. What does it really mean to be a Delta Gamma? What does it really mean to be a sorority woman? To be Greek? The heart of our sisterhood is our ritual. 140 years ago, three women didn’t just make promises. They began living a ritual. What is a ritual? If you look it up in the dictionary, there are many definitions. At its most basic, a ritual can be defined as: “an unchanging pattern” or “an established and prescribed pattern of observance” or, “a set of actions, performed mainly for their symbolic value.” While subtly different, in all of these cases rituals are things that are done repetitively. A ritual must be done more than once. It creates a pattern. And most importantly, it means something. Ask most Greeks what they think of when they hear the word “ritual” and most of them will respond with “initiation.” When I think of ritual, quite honestly the first thing that comes to mind for me is Mass. Maybe that’s the Catholic School in me showing through. But for me, the word “ritual” is associated with “sacrament.” If you look that up in the dictionary, well . . . the dictionary doesn’t quite know what to make of it, so don’t bother. The best definition of a sacrament that I’ve ever heard is quite simple: a sacrament is an outward sign of an inward grace. With that definition, there are far more than just the seven sacraments of the Catholic Church that I was raised with. And in the same way, “ritual” extends far beyond initiation. Do the two really have anything in common? The answer is yes. While our Greek rituals are centered around what happens at initiation, and the sacraments are essentially contained in the “big seven,” the real gifts and graces we receive extend much further. Once we have been initiated it becomes our responsibility to take all of our newly bestowed knowledge and act upon it. Similarly, when we receive a sacrament, we receive a grace that is meant to move us toward action. You can’t simply receive the body of Christ and say, “Okay. I’m done now. I’m keeping this Christ to myself.” No. You are supposed to receive Christ’s presence in the Eucharist so that you can take Christ into the world and into the lives of other people. In the same way, once you are initiated, that’s when the true ritual begins. It is meant to become a part of your everyday actions. We are meant to live our ritual by acting out the promises we make to each other, by upholding the values of our founders, and by living our lives in such a way that we are no longer quite the same. Our sisterhood and brotherhood should become ritual; it should become an established pattern of living. I can’t tell you how to live your ritual. Everyone will live theirs a little differently. For me, living my ritual means supporting my sisters in any capacity that I can. Of course, being 4000 miles away makes that a bit difficult, but that doesn’t mean I don’t still try. And the same can be said in reverse. Even though I’m much too far away from my sisters for them to really talk or spend time with me, they still find ways to build me up. This week I received one of the best presents I have ever gotten, and I’m not exaggerating. It was a simple box really, with some fun gag gifts covered in red white and blue stars-and-stripes to remind me of home, but it carried with it the thoughts and hopes and love of my sisters. There were random notes (which are all hanging on my bulletin board). There were bags and bags of candy, especially the candy I’ve been craving here. There were even boxes of Girl Scout Cookies! And then there were things like Tony’s and some instant Community Coffee, to remind me how good Southern flavors taste. But everything in that box had a purpose. It might have looked like a completely random assortment to anyone else, but to me it represented the love of my sisters who took the time to think about what would be meaningful to me. (And they totally got it right. Give me food over anything else, and I’m a happy camper. Especially chocolate.) But I guess it just goes to show that living your ritual can take many different forms. Like our new pope. Let me just say first of all, I’m slightly obsessed with Pope Francis. He’s a different one. And I like that. He understands what it means to “live your ritual,” although he does it slightly different than like every other pope. But I think we need that. I think that God is too big and too great to be confined to just one perspective and way of doing things. While I believe that God should be represented in a way that inspires awe, I believe he also presents himself to the world as that still, small voice. While He is most certainly great, he often takes a humble form. And so each pope that is chosen represents a part of God in his own way. I think John Paul II gave us a glimpse of God’s joy, and Benedict gave us a glimpse of God’s love, and Pope Francis is now offering us a view of humility. In only 48 hours, we’ve seen how Pope Francis’ humility shines through everything he does. That is what it means to live your ritual. So on this Founder’s Day weekend, as the words of initiation reach the ears of Delta Gamma’s new members for the first time, I challenge you to find at least one way to live your ritual better, wherever you are. Whether you are right in the middle of your chapter, or if you are halfway across the world. Whether you are Greek or not. We all have something to live out. Faith, values, ideals, hopes . . . just go out and do good. What do you get when you combine trains, archive libraries, and a movie set tour? A nerd-tastic day in London!! My very first trip to London ever was marked ceremoniously by doing the nerdiest things possible in the city (and I’m extremely blessed to have a friend here who is just as much of a dork as I am). As soon as we arrived in London, we made our way to King’s Cross Station. That’s right. The station where Harry Potter got on the train for Hogwarts. 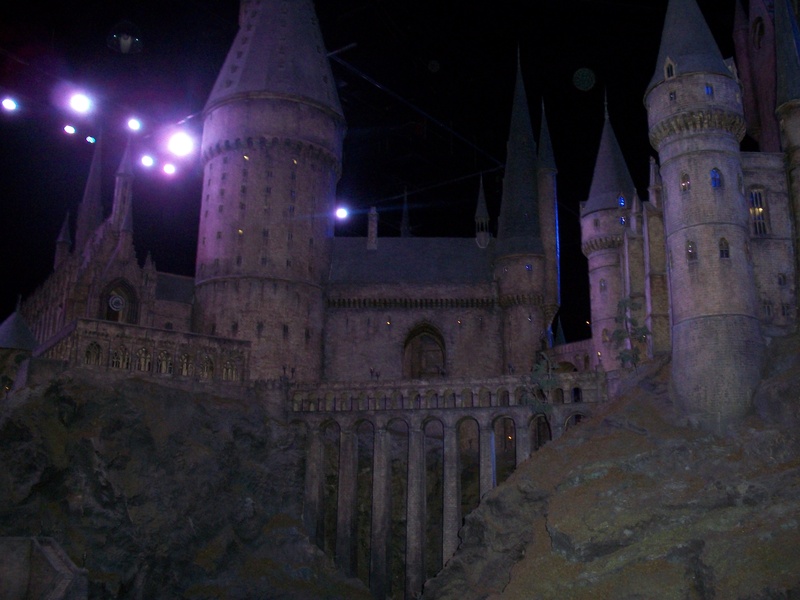 And of course that’s exactly the reason we went there: to take a picture between platforms 9 and 10. Unfortunately you can’t actually get to the train platforms without a train ticket, which is fine because that means the actual Platform 9 ¾ is not mobbed with muggles and the wizards can still inconspicuously get to school. But for those of us muggles who actually want to pretend that we are magical (because we are…we just couldn’t get our letters because the Battle of Hogwarts was going on at the time), the kind people of King’s Cross have erected a sign on the wall that says “Platform 9 ¾” and directly underneath the sign is a luggage trolley that is halfway “through” the wall. It even has an owl cage on the trolly. Not only that, however, but Platform 9 ¾ is such a popular picture spot that we waited in line for like 30 minutes. (Ok, maybe it wasn’t that long…but it felt like forever! It was totally worth the wait though), and there are actually two people who work there. There’s a professional photographer, and a crowd-control-scarf-giving guy, who basically just keeps people in line and has a small collection of Harry Potter scarves that you can borrow from him to take a picture with. So of course I threw off my Gryffindor scarf (the only Harry Potter scarf I own, which I bought at Harry Potter world before I was sorted) and traded it for none other than a beautiful yellow and black Hufflepuff scarf. If you haven’t seen it, go look at my Facebook. That picture alone got something like 45 likes, so basically if you’re my friend you probably liked it. And if you didn’t actually click the like button, then it probably popped up on your newsfeed a bunch of times. Anyway, after our wonderful trip to King’s Cross, we had a few hours until our time slot for the Harry Potter Studios Tour, so what did we do? Walked around the most epic library EVER!! Let me just tell you about the sheer epicness of this library, because if you were walking around in London and passed this building, you probably wouldn’t go in. It’s nothing special, really. It’s a very unassuming building, just sort of chillin’ next to this GORGEOUS hotel. If we didn’t know what we were looking for, we probably would have passed it. So how did we discover this hidden jewel? In the nerdiest way possible. There’s this website called “Nerdy Day Trips” (I’m not making this up, y’all), and we just plugged in “London” and boom, a bunch of spots came up. This place looked pretty cool, I mean what nerd doesn’t like libraries? And apparently they had the original Magna Carta. Awesome-sauce. I, however, was not prepared for just how epic this library truly was. Do you know what I found on display there? SHAKESPEARE’S FIRST FOLIO!!! For those of you who don’t know, I am taking a Shakespeare course here in England, and for this reason I know that the First Folio is the very first published collection of ALL of Shakespeare’s plays, put together shortly after his death! So we’re talking, like, 1600’s. This book is from the 1600’s. Wrap your mind around that. It’s about as old as the oldest city in the United States (which is only about 60 years older). CRAZINESS. I literally almost cried with happiness when I saw it. I think there are probably marks on that glass case from my nose being pressed up against it. Wouldn’t be surprised if there were drops of drool either. I was freaking out y’all. We also saw awesome stuff like the original handwritten manuscripts of many famous musicians like Handel, Haydn, and Schubert. We of course saw the Magna Carta. We saw lots of old Gutenberg Bibles, and lots of other old religious texts. But you know what second-most awesome thing I found was? I found the actual handwritten letter from Queen Elizabeth I ordering the beheading of my ancestor, Sir Robert Devereux, Earl of Essex! I had known this story for many years, that I was related to this famous English nobleman who was extremely close with Queen Elizabeth and then tried to lead a rebellion against her and lost his head in the process. His entire family was then banished to Ireland (and that, folks, is why we Devereux’s are Irish). But this was totally unexpected. An actual letter! In Queen Elizabeth’s handwriting! I feel somewhat guilty saying that I was excited to find my ancestor’s death sentence, but I do think it has a level of epicness. After we had sufficiently explored the library (of which I have no real pictures because pictures were not allowed in the exhibits), we headed back to the train station to catch our train to Watford Junction, a suburb of London where the WB Harry Potter studio sets are! If I go into every detail of the trip I might as well just turn this into a book, so I’ll just give you the highlights. 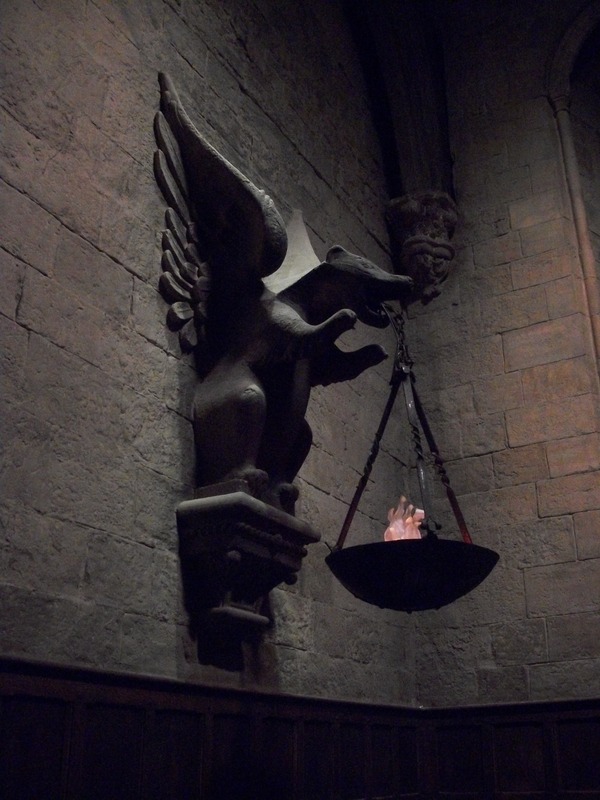 First of all, standing in the Great Hall was absolutely wonderful. I noticed so many details I wouldn’t have noticed otherwise. The lanterns are hung by the different house mascots, like this handsome Hufflepuff badger. I can now check off “fly on a broomstick” from my bucket list. 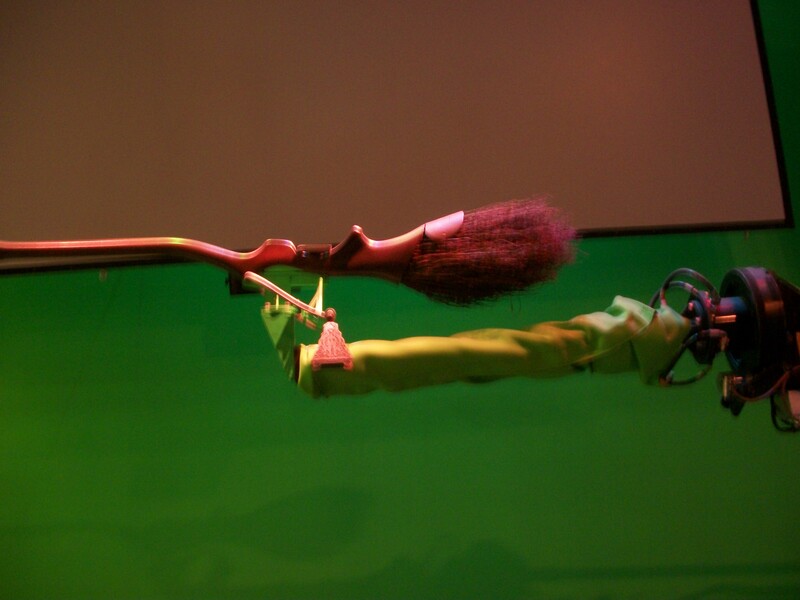 While I was on the broom, I could watch a live video of myself in which the green screen was replaced by various scenes of London and Hogwarts. One minute I would be flying through the streets of London, and the next I would be flying over the water, zooming up to the top of Hogwarts castle. They even let me borrow a set of Hufflepuff robes for the occasion, and I went into full tourist-mode and bought the souvenir photograph. I chose the scene where I was flying over Hogwarts. It’s a great picture. No regrets. If you haven’t stalked my album on Facebook, go do it (going backwards from the first picture is probably the best idea, since the album now has over 700 pictures in it. It might take a while to start from the beginning). But for now I’ll just leave you with this. No words. Just epicness. I’ve seen Hogwarts. I’ve walked on that bridge. I can now die happy. Cheers mates! It’s been a while. What have I been up to, you ask? Oh, a little of this, a little of that. Lots of fun, as well as lots of work. You know there’s this thing called school? Apparently it requires work. Go figure. 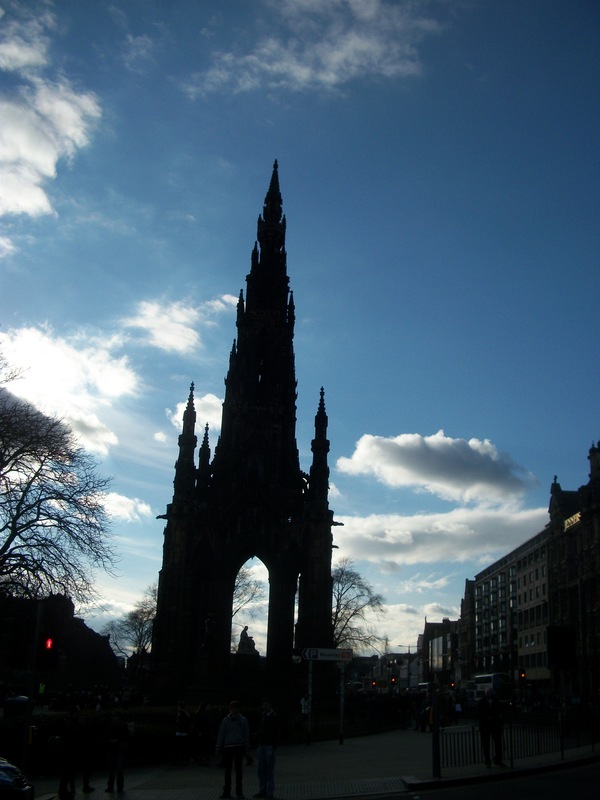 In the middle of all that work, however, I took a little weekend trip with some friends to the beautiful and fun city of Edinburgh, Scotland! It was well worth it. Scotland blew me away. Can I just live there, please? Apparently there aren’t enough people there. Did you know that Scotland has twice as many sheep than people? Yep. There are close to 10 million sheep, and only around 5 million people. 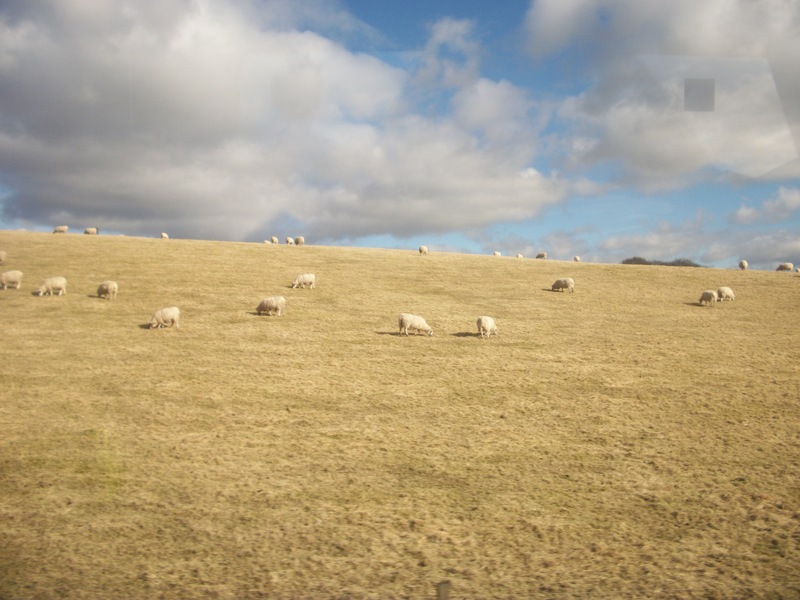 On the rather lengthy coach ride, we passed many a field that was covered with adorable and fluffy little sheep. Look! Scotland truly is a beautiful country. This hill that the sheep are grazing on is just one small hill out of thousands (probably even millions) of rolling hills, craggy moors, and beautiful mountains. As much as I wanted to sleep on the coach, it was hard to stay asleep for long. I just wanted to take in the scenery! Even in the middle of a large metropolitan city, there is still great scenery. See that? 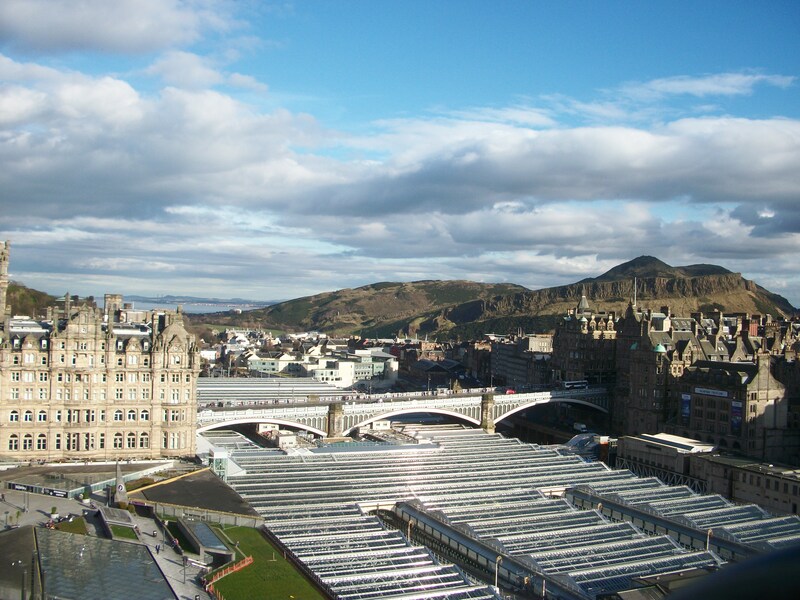 That’s what they call “Arthur’s Seat,” like the legendary King Arthur. No one exactly knows why it is called that, although it might possibly come from the Gaelic words Àrd-na-Said, implying the “Height of Arrows”, which over the years became Arthur’s Seat (perhaps via “Archer’s Seat”). In any case, it’s an absolutely beautiful hill and it’s a popular place for tourists to climb because it’s a relatively easy walk. I didn’t actually climb it, however. View from inside the staircase–almost there! 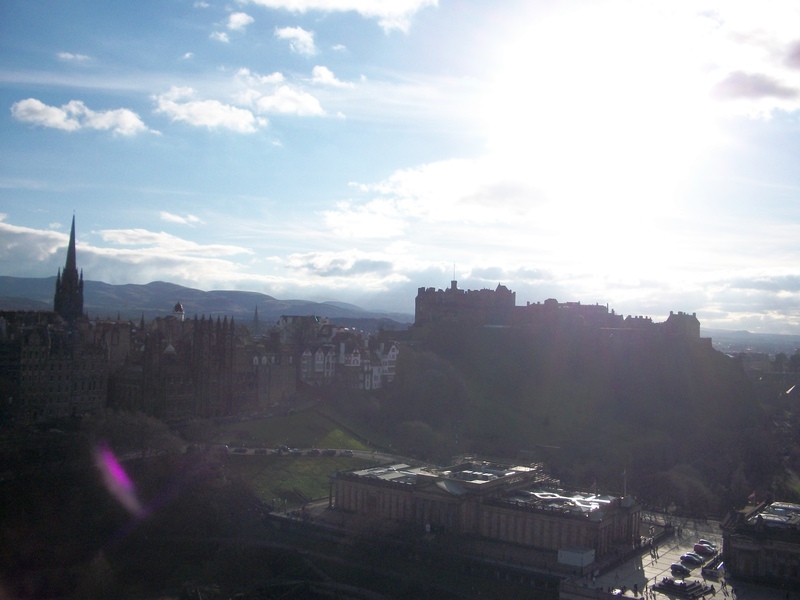 We also saw the breathtaking Castle of Edinburgh, with parts of it dating back to the 11th century. I swear I could have spent all day in the castle. It was fantastic. We were able to see rooms from the old royal palace, and stand in the room where King James I was born, successor to both Mary Queen of Scotts and Queen Elizabeth I (also the first British king to be born in Scotland and rule over both Scotland and England as a united kingdom). We saw the actual Crown Jewels of Scotland too!! 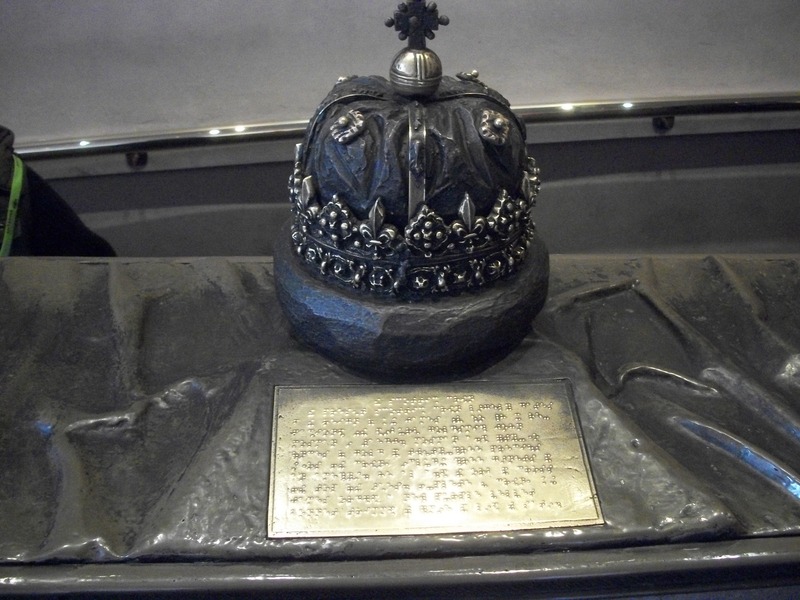 They are not only the oldest complete set of crown jewels in all of Europe (with the oldest part of the set, the scepter, dating back to 1496), but along with the crown jewels was a large rock known as the Stone of Destiny. Sound like an overly dramatic name? It is. It was originally called the Stone of Scone (named after a monastery, where the stone used to sit), and it is known as the metaphorical cornerstone of Scotland. It was renamed by the Victorians, who apparently just liked to make everything prettier and more dramatic. In any case, that giant rock is where all the kings of Scotland have sat when they were coronated, and is actually still used today. Or rather, it will be used whenever Prince Charles becomes king. It is placed under the throne during British coronations. Pretty interesting, huh? It’s just a giant piece of rock, but it contains so much significance. Of course, no one’s really sure if it’s the real Stone of Scone, but that’s another story. In any case, the Crown Jewels and the Stone of Destiny (Scone) were so heavily guarded and protected that no photographs were allowed. I may have taken lots of “illegal” pictures in other parts of the city, but I wasn’t about to mess with this one. So here’s a sculpture of the crown, designed so that someone who is blind can read about it and feel what it looks like! While in Edinburgh we also took a quick look around St. Giles Cathedral before it closed for the day (where I may have gotten a few photos I wasn’t supposed to take . . . oh well. No regrets. 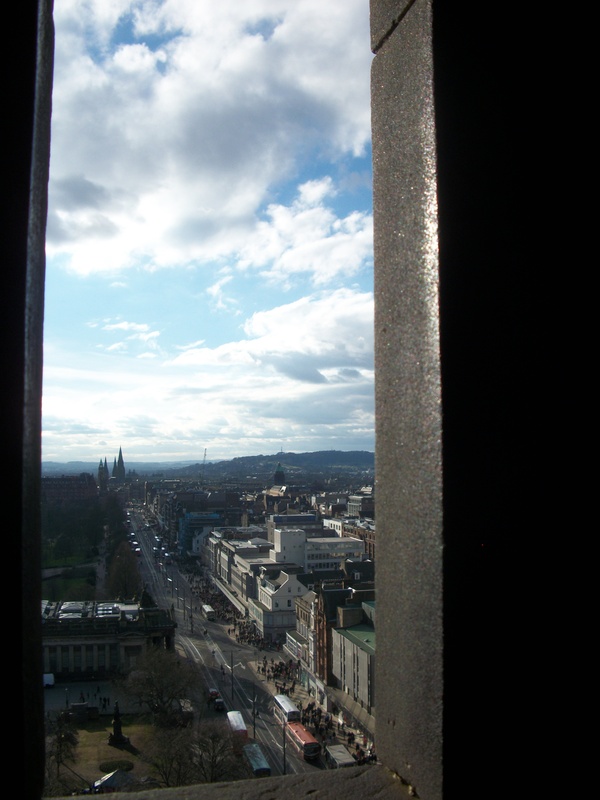 I’ll go to confession), we saw the fantastic National Museum of Scotland (which is on the “Top 100 Museums to See Before You Die”), and did a little shopping along the historic Royal Mile (where I bought myself a plaid 100% Scottish wool scarf). I was even brave enough to get a meal of haggis for lunch! Probably my favorite parts of the trip, however, were going on a ghost tour of the city at night and then passing The Elephant Café where JK Rowling wrote Harry Potter. Both experiences were pretty epic. While I didn’t meet any ghosts (or JK Rowling either), we still had a really great time. And we saw lots of boys wearing kilts. Which is slightly disturbing thought because of a long-standing Scottish tradition . . . but let’s not go there. Overall it was a fantastic trip. I got to spend time with some really great people (one of them being a DG sister!!) 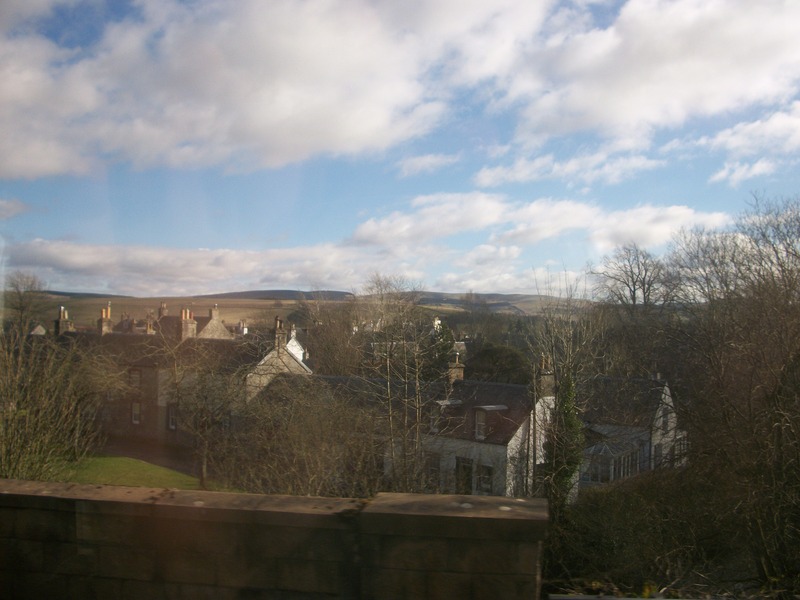 and somewhere along the line I fell in love with Scotland. I know, I say this about everywhere that I visit here, but truly Scotland has a special place in my heart. Be it bagpipe music, Scottish hills, or the rich history that comes with the land, there’s something wonderful about Scotland. So . . .